So, my day is pretty close to perfect right now. Do you want to know why? It’s because it started with cheesecake. Strawberry Cheesecake Oatmeal that is. I think I’ve mentioned it before once or 5 times…but just in case I haven’t said it enough, cheesecake is my absolute favorite dessert on this planet. There’s just something about that sweet, cream cheese mixed with an assortment of berries and chocolate that nothing else can really compare to. Unfortunately, it just happens to be that my all time favorite dessert is also one of the most calorie packed desserts that there are. There are very few times that I don’t feel guilty immediately after demolishing a giant slice of creamy, strawberry cheesecake so I don’t get to eat it as often as I would like (which would be everyday). But this Strawberry Cheesecake Oatmeal with white chocolate chips? I could eat it every morning and not regret a thing. Why? Because it’s only 257 calories for the entire bowl of pure greatness. This is like one of the few times that you can practically eat dessert for breakfast and it be totally acceptable! Add oats and water to a saucepan and cook on medium heat until oats are soft, approx 5 minutes. Mix in tsp of brown sugar. 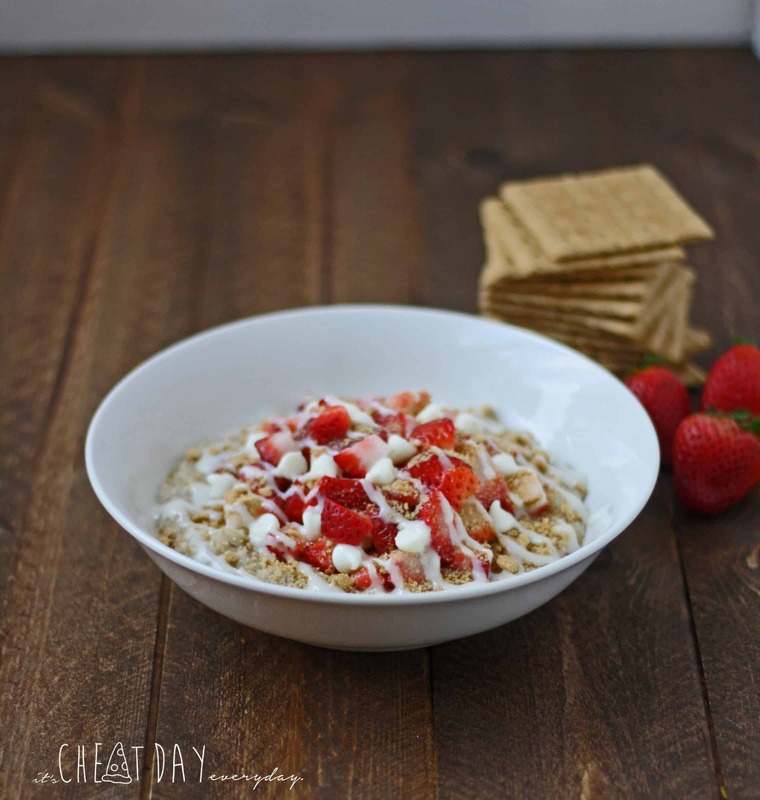 Transfer oatmeal to bowl and top with diced strawberries. Top with white chocolate chips and enjoy!